Pictured below is a thermostat we have just completed which includes an LCD display and temperature datalogging to a micro-SD card. This will be used to control and monitor a small (4′ x 4′ x 6′) shed cooling system. The cooling parts of a second hand fridge have been mounted to an inside wall of the shed, and this thermostat with its digital temperature sensor and relay is used to turn the cooler on and off as and when required to keep the shed cool. 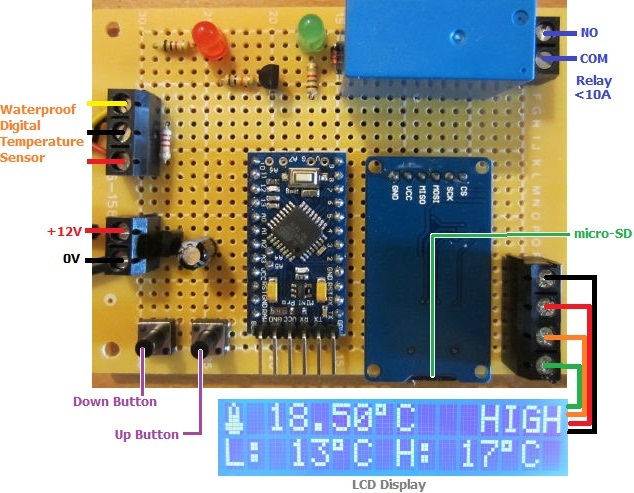 The display shows the current temperature of the shed and the system status. The user can set the high temperature and low temperature thresholds at which the cooler will be turned on and off respectively; and their chosen thresholds are displayed on the bottom line of the display. Every 30 seconds the temperature of the sensor and the cooler status (on=1, off=0) are logged (written to a csv text file on a micro-SD card) for later analysis on a computer using Excel or similar. If you need something similar to this, or anything else utilising temperature datalogging, monitoring, and control, email neil@reuk.co.uk with details of your requirements.